When first welcoming our student group to Ol Pejeta Conservancy’s Endangered Species Facility, Mwenda warned us that our morning with him would be one of mixed emotions. With the bright Kenyan sun filtering through the open roof of our vehicle as it rumbles down an uneven dirt trail, it is impossible not to catch Mwenda’s infectious enthusiasm first. 18-year-old Fatu is one of the last two known northern white rhinoceroses. Her 36-year-old mother, Najin, observes us quietly from the shade of a squat tree. Perhaps Najin is still getting used to the hot African sun – after all, both she and Fatu were born at the Dvůr Králové Zoo in the Czech Republic, and only arrived in Ol Pejeta 10 years ago. Perhaps her legs are bothering her – both she and Fatu suffer joint issues from spending their formative years on concrete surfaces. These maladies prevent them from successfully reproducing, thwarting the intention of the relocation to a more natural habitat. Or perhaps she is simply taking a break from the attentions of the tourists that blow through her isolated enclosure every day, snapping pictures and hanging precariously out windows for a chance to touch one of the rarest animals on Earth. While we intruders are confined to the Cruisers, Mwenda stands freely next to Fatu, occasionally tossing her another carrot and tossing anecdotes to his audience. 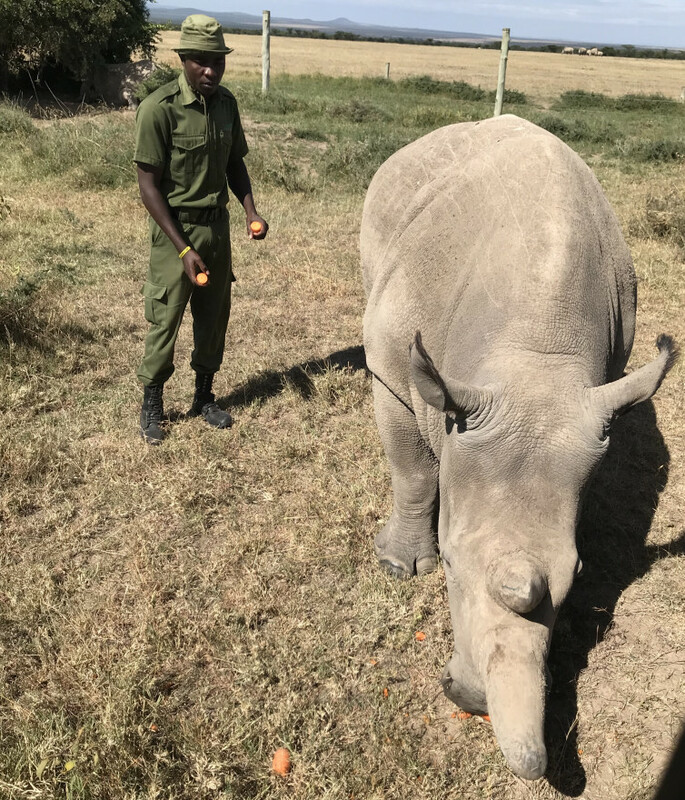 After eight years of working at Ol Pejeta, he is used to sharing space with an animal that rivals our vehicle in size and wields two curving horns on her oblong snout. Those magnificent horns, composed of the same keratin that makes up human fingernails, are the reason that only two northern white rhinos remain, hidden away under heavy guard. When political unrest struck many African countries in the mid-twentieth century, conflicts were frequently financed by blood-stained rhino horn, poached for its high value as traditional medicine. The northern whites, distinguished from their southern white cousins by their tufted ears and their black rhino relatives by their wide grazing mouths, were hardest hit by these illegal campaigns, and their numbers plummeted. Now, the last mother-daughter duo will live out their days in the shadow of Mt. Kenya, with only a southern white companion to mentor them in natural behavior, and a cadre of humans tasked with easing the passage of yet another species into oblivion. The tragic tale of the northern white rhino is hard to listen to without your heart sinking into your gut and a righteous outrage burning behind your eyes. However, Mwenda is a master of walking the line between despair and optimism. For every sad statistic, he includes a charming fact about rhino behavior – as a noteworthy example, he spends several minutes explaining how they defecate in a communal “midden pit” to stay clean and swap olfactory signals with distant neighbors. He also offers us hope for the future. While neither Fatu nor Najin can breed, and their male counterparts are gone, the genetic material of their species lives on in labs around the world. In-vitro fertilization of a rhinoceros is an unprecedented, risky, and costly procedure, but Mwenda assures us that the scientists and caretakers that make up the Last Chance for Survival initiative are working tirelessly to beat the odds. The female southern whites that watched us suspiciously as we traveled through other parts of the park, stepping pointedly between us and their curious calves, may be the surrogate mothers of the next generation of northern whites. Mwenda considers himself an educator as much as he is a caretaker, and is dedicated to raising awareness of the plight of his “girls.” He communicates his experiences, his knowledge, and his thoughts about issues ranging from the environmental to the social via his popular Instagram account, @jemu_mwenda. A member of our group, Caitlin Schiavoni, discovered Mwenda’s social media after hearing about his heartbreaking tribute to Sudan, the last male northern white rhino, who died in 2018. “It was inspiring to see someone still so hopeful after dealing with such devastating loss,” she remarks. For now, though, our time with the rhinos is done. Our Cruisers bump away across the savanna, and Fatu and Najin dwindle in the distance until they appear to be nothing more than a pair of dusty gray rocks rising from the sea of grass. After a quick group photo (which fittingly ends up on the account that brought us together), Mwenda gathers us one last time to issue two challenges for our return home. “Share what you have seen today,” he declares. We agree, because how could you deny the power of a picture or story to a man who has touched lives around the globe? “And plant a tree,” he adds with a smile. We agree, because how could you deny the importance of seemingly insignificant action to a man who guards the last of a species? I will always work towards the first challenge. Perhaps I will double the second, and plant one tree in honor of every northern white rhino left on Earth.